If you grow and love collards, and have never frozen any, you should. I clean them and tear them into small pieces, then cook them about 20 minutes. Drain, cool, freeze in good portions. They come out of the freezer tasting like you just picked them this morning, honestly! If I don’t freeze some from the garden, then in the winter I have to buy a whole plant at the grocery store when I want some. Unless you’re making a big pot of greens, a whole plant is a lot. I like to get a bag of these out and put them in soup in the winter. Also, to saute them a couple of minutes with some Rotel (tomatoes and green chilies, I love the stuff. There are always a couple of cans in my pantry.) and then grate some fresh Parmesan over them. I was pretty lucky this year that for some reason I didn’t have nearly as much trouble with cabbage worms on the collards as I have other years. Last year especially they were a big problem, so this was much better. Ahh, fall will come to Pennsylvania. The garden has some things winding down. The tomato plants are starting to look bad and the cukes are pretty much over. But Limas and some other beans are just really getting rolling. And I planted a little group of spinach and peas, which will be ok here as our fall weather comes on. We’ve got Brussels sprouts for the first time and the sprouts are probably the size of a pea, and I don’t know just what to expect from them. And of course, I can count on my collards to keep producing new leaves till probably the end of September, maybe October! It’s sad to see the garden coming to an end, but the cycle goes on. And there are neat seed catalogs to study thru the winter, and plans to be made for next year. And I always keep notes, so I don’t forget what was good to do and what not so good to do. If you garden, I hope yours did well. Did you freeze them before? They really are just like you picked them this morning. Fresh garden greens, right out of the freezer, in January, mmmm. Enjoy your weekend! Excellent blog, Sarasin. I love the little details! I should try Rotel, by the way – I never have! Thank you so much, and thanks for visiting. Rotel is very good stuff, just enough heat, and I add it to a lot of things for the unique taste it gives. I think it’s available across the country. I love vegetables. So, a while ago, I bought some collards at the farmers market, because I had never had tasted them before. I rinsed the collards in some water and then I put them in a big pot and turned the heat on. When the water began to heat up, lots of frantic bugs suddenly appeared. They started throwing themselves out of the pot like they were abandoning a sinking ship (rather like a scene from “Titantic”). Bugs everywhere!! 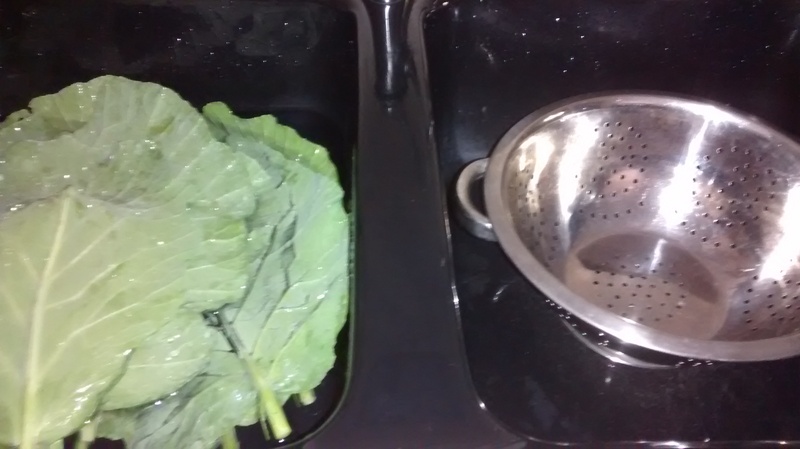 I thought I had rinsed these collards thoroughly, but apparently not. Not knowing what else to do, I took the pot outside, dumped the water and the bugs, and left the collards in the grass. So. I still don’t know what collards taste like. Oh dear, I’m sorry you didn’t know how to handle them. They do attracts living things, especially the under side of the leaves. They take more than rinsing, but they’re worth the trouble. First, do rinse them off, to remove any sand or ground. Then run your sink full of cold water and add and dissolve about a teaspoon of salt in the water. Then take each leaf separately and look on the underside, looking for bugs and more likely worms. Then soak the leaves in the salt water for maybe 15 minutes. The salt water should make anything alive get off of the leaves and into the water. Then rinse them again. And, the big rib down the center of each leaf is no good. It will be tough and ugly even if you cook them till tomorrow, lol. So once you have them washed, remove the big center stem most of the way down the leaf. You can use a knife, but I just sort of tear them down. Then you’re ready to tear then into some smaller pieces and cook them. Whether in a soup or another dish or just plain, you should cook them about 20 minutes. Turn the heat down once they boil, cos they will cook over: they contain a lot of calcium and other nutrients, and will cook over like a pasta will. Good luck. I hope you’ll give them another try. Search keywords……..to see if I blogged about it!